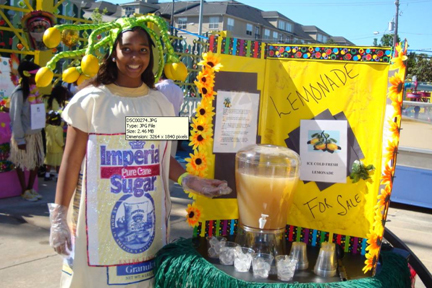 Below is a picture of Alexis Cross in the lemonade day competition this past Saturday at the Children’s Museum. She was dressed as the “Imperial Sugar Girl” and will be this Sunday as well. Thank you for promoting this wonderful opportunity for kids to explore being an entrepreneur. If you are in the neighborhood we would love to extend a personal invitation for you to stop and say hello. She will be selling her product on Lemonade Day this Sunday 5/2 in front of the Sienna Plantation CVS located on Hwy 6 (Sienna Parkway) in Missouri City, Texas. Alexis will take the proceeds she makes to support the Military Moms of Brazoria County. She will use the money to purchase Ramen Noodles for the Troop goodie boxes she helps them pack to send overseas as part of her community service work as a Girl Scout. We are so proud!